UFA has gathered statistics both on the fishing activities of the area’s residents across local and other state fisheries, and numbers on fishermen and crew from throughout the U.S. states that participate in Bristol Bay’s fisheries. Sources include state and federal agencies including Alaska Departments of Revenue, Fish and Game (ADF&G), Labor, Commerce, Institute, Commercial Fishery Entry Commission (CFEC), and NOAA Fisheries. The numbers are from calendar year 2016 and fiscal year 2017 for the Bristol Bay Borough, Lake and Peninsula Borough, and the Dillingham census area, and fishery-by-fishery in the Bristol Bay CFEC Area T region. 879 local permit holders and 1,012 full year resident crew fished commercially in 2016 in the region – 22% of the region’s total population. Over 30% of Bristol Bay Borough residents fished commercially in 2016 – top among all Alaska boroughs or census areas. $3.7 M in shared fisheries tax revenues to local communities and boroughs, and an equal amount to the State of Alaska, and $5 M in local fisheries landings taxes. Permit holders from 48 states and crew members from every U.S. state fished in Bristol Bay salmon fisheries in 2016. Residents from 97 Alaska communities own Commercial Fisheries Entry Commission permits to fish in Bristol Bay. Crew members from 83 Alaska communities purchased their crew license in Bristol Bay. Salmon ex-vessel income from Bristol Bay salmon was $192 million in 2016. Preliminary results from 2017 show an increase to $214 million. Nearly 100% of local residents fish for subsistence, with an average of over 200 pounds harvested per permit. Residents from 25 Alaska communities outside the Bristol Bay region fished for subsistence in the area – including 92 from Anchorage. 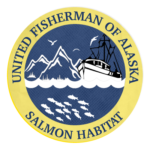 UFA emphasizes the importance of commenting on the Pebble Mine EIS scoping process among the network of individuals interested in Alaska salmon habitat developed under the SHIP program and will make its own comments available as a resource in the weeks before the deadline to comment on June 29, 2018. 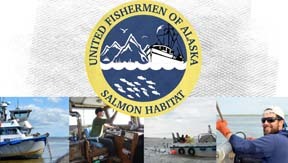 The Bristol Bay Fish Facts are online at the UFA SHIP page at http://www.ufafish.org/habitat/ .